... is a traditional freehand oil painter, who has been painting full time since 1995. 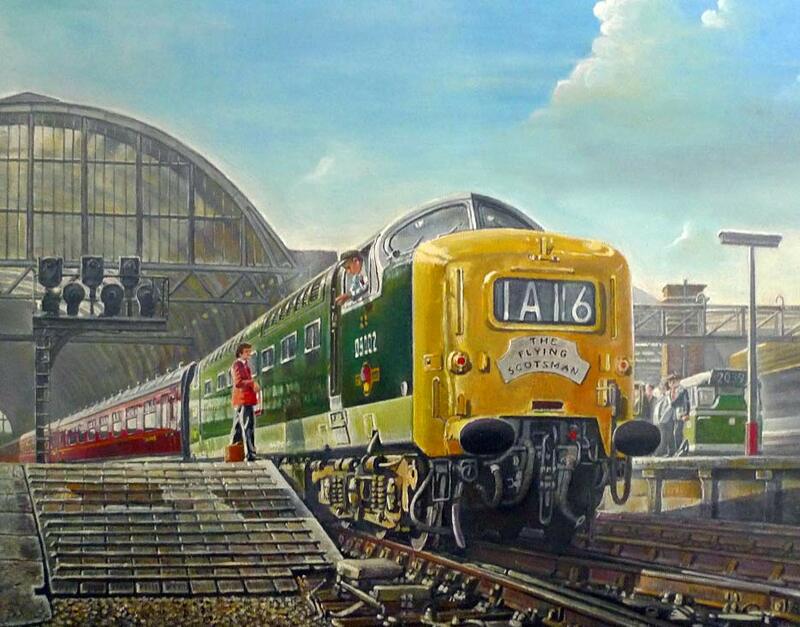 He was accepted by The Guild Of Railway Artists in 1993, and has always shown interest in Steam Trains from a child. Kevin enjoys painting not just railway subjects, a local gallery commissioned him to paint a series of Bygone Scenes of Birmingham and London of the 20th century during 2005. This led to two sell-out exhibitions at the Gallery in 2005 and one in 2008. His paintings have a full tonal range, with highlights sometimes consisting of several layers of paint. 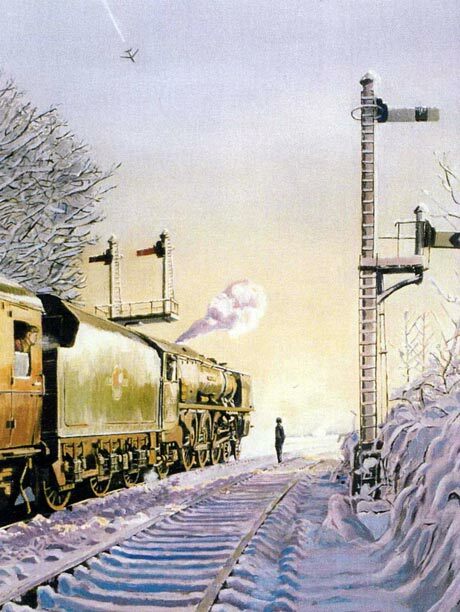 Kevin's railway art is in both monochrome and colour and his art can often be seen in Guild Of Railway Artists art exhibitions and at Leamington and Warwick Model Railway Club. You can also find some of Kevin’s recent work on display at The Mitchell Gallery in Warwick, including The Warwick Collection - a series of original pieces of art depicting well known scenes of Warwick, in various weather conditions. You will also find his art in such diverse genre as Doctor Who and Progressive Rock! LMS Stanier pacific 'City of Birmingham' in 1963. This view shows the engine about to receive some running repairs! 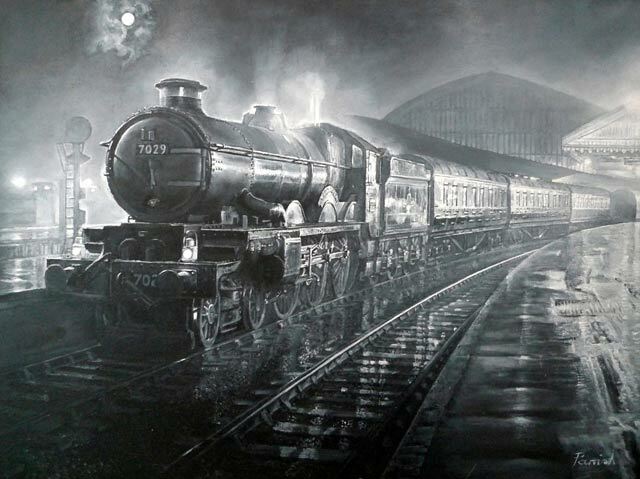 This painting was initially inspired by friend and fellow steam railway enthusiast, Mr David Norton, who drove No. 7029 as a participant of the 'Drive A Locomotive' Course run at Tyseley, Birmingham in the 1990's. Castle Class Locomotive waiting at Paddington Station in 1960. The engine was fitted with a double chimney in 1959. Clun Castle was the last Great Western Steam Locomotive to haul a passenger train departure from Paddington, London on June 11 1965. Kings Cross station in 1965. Deltic diesel D9002 'The King's Own Yorkshire Light Infantry' waits to leave with the Flying Scotsman. 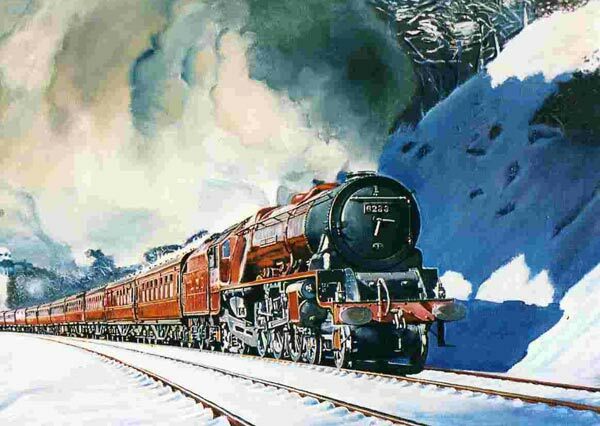 A red Stanier LMSR Duchess class loco heads an express in the 1930's. Inspired by a photograph of Leamington Spa (Milverton) Station.. 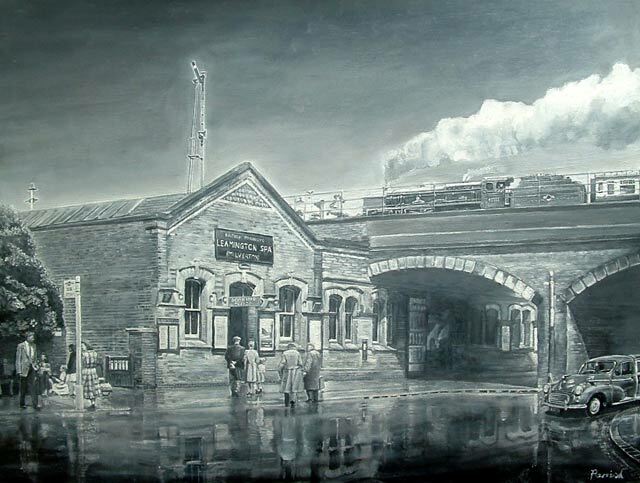 It depicts the station at road level in the late 1950's. Living locally and being fascinated by the history of the steam railway prior to the demise of steam in 1968, Kevin decided to create a scene typical of the late 1950's when steam trains were in their heyday. Using photographic material and vision through his mind's eye, we see people heading for the booking office, after early morning rain, in time to catch the express train arriving at the station. The locomotive is a Patriot Class hauling Stanier coaches on its way to Liverpool via Berkswell on the London North Western Railway. Passengers wait patiently at the bus stop for the next bus to Royal Leamington Spa, while a Morris Minor 1000 estate car emerges from under the viaduct travelling onto Warwick from Royal Leamington Spa town centre. The history of the station is fascinating. The station opened in 1844 and was a terminus called Leamington, with a branch line to Coventry. The Rugby to Milverton (Leamington) Station line was opened in 1851. The station name changed many times during its life and finally became known as Leamington Spa (Milverton) for Warwick in 1952 by British Rail.